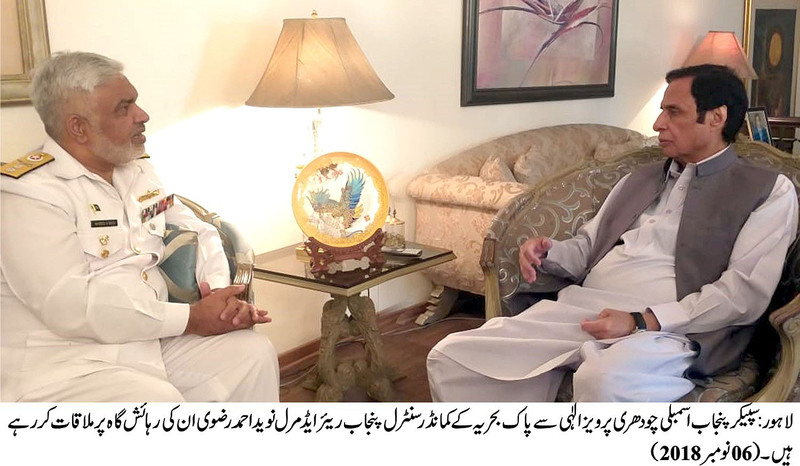 Lahore: 06-11-2018: Pakistan Navy’s Commander Central Punjab Rear Admiral Naveed Ahmad Razavi (Hilal-e-Imtiaz Military) called on Speaker Punjab Assembly Ch Parvez Elahi at his residence here today (Tuesday). During the meeting, views were exchanged on matters of mutual interest And souvenirs were also presented. Ch Parvez Elahi said that be it war or peace, Pakistan Navy has always rendered great services for the motherland which are bright chapter of our history and entire nation views them quite appreciably.